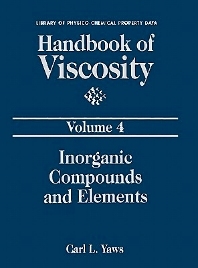 Volume 4 expands this series to include inorganic compounds and elements in addition to the organic compounds covered in the first three volumes. The data are presented in graphs for viscosity as a function of temperature. The graphs are arranged by chemical formula to provide ease of use; many of them cover the full range from melting point to boiling point to critical point. Common units are used, but each graph displays a conversion factor to provide English units. Preface. Viscosity Graphs for Inorganic Compounds and Elements. References. Appendix A: Coefficients for Liquid Viscosity Equation. Appendix B: Coefficients for Gas Viscosity Equation. Appendix C: Data Code for Compounds. Appendix D: Compound List by Formula. Appendix E: Compound List by Name. Appendix F: Computer Program for Liquid Viscosity. Appendix G: Computer Program for Gas Viscosity.